A thrilling account of the rescue of RAF crewmen after their aircraft crashes in Afghanistan … in 1919. The 3rd Afghan War in 1919 was the only time that the Afghans invaded British India during Britain's long history of conflict in Afghanistan and along the North-West Frontier. It was a campaign that cost the lives of well over 1,000 British and Indian troops. This is the story of an unknown action of this little-known war, an aircraft crash and rescue. An aircraft of 20 Sqn RAF was lost, whilst investigating a gathering of tribesman. The crew were rescued and the majority of the aircraft was recovered by members of the Kurram Militia and 22 Battery Motor Machine Gun Service. It was an all-arms action - the lives of 2 airmen were saved at the cost of an Indian Militiaman and an unknown number of Afghan tribesmen. Above all it is an action which typifies the experience of a virtually unknown group of soldiers, 22 Battery of the Motor Machine Gun Service. They had volunteered to serve as Motor Machine Gunners in France, had been through an intense and very competitive selection process, frequently expending considerable sums of their own money just to attend selection interviews, and had suddenly found themselves despatched half way round the globe to the heat, dust, snows and monsoons of India and the North-West Frontier. This book looks at the background to the conflict, the Kurram Militia, the history of the squadron and the lives of the key players. Whilst this was not the only action the 22 Battery of the Motor Machine Gun Service fought during the 3rd Afghan War, this one was recorded in the account of A/Sjt Ernest ‘Bill' Macro, who was in charge of the section of 22 Battery despatched to Badama Post in late July 1919. 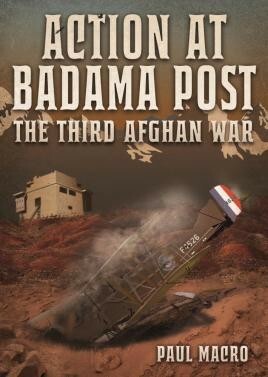 This is his story, and the stories of the other men for whom the climax of their experience in the 3rd Afghan War came during the action at Badama Post.